Face it, you have pretty much everything you need in life, except a New School t-shirt. One for every day of the week. With the iconic CNS apple-tree logo. We've got them in blue, blue and blue! Get your order form here. You need some pencils. And not just any old pencils, but some CNS pencils. You need pencils with the same easy good looks you wear every time you leave the house. You need pencils that work even when the internet goes down, pencils that may or may not spell better than your average Ticonderoga. When you write with a genuine, no. 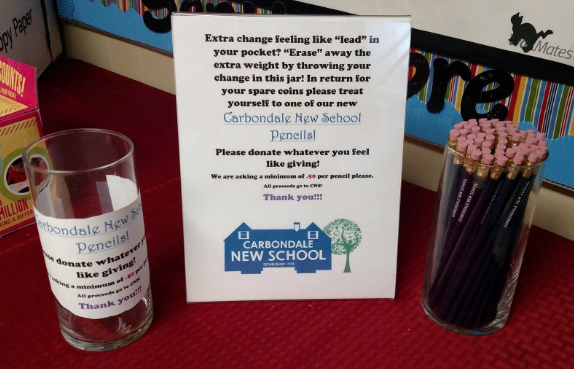 2 Carbondale New School pencil, your work is auto-saved--no more of that annoying where'd my file go? And if you make a mistake, there's an undo button on the opposite end. One size fits all, in classic navy-blue with white lettering, the new CNS pencils are just itching to hang with the pens in your pocket-protector. Look for them in the lobby of the main building. All proceeds to benefit CNS, minimum donation amount $.50 per.